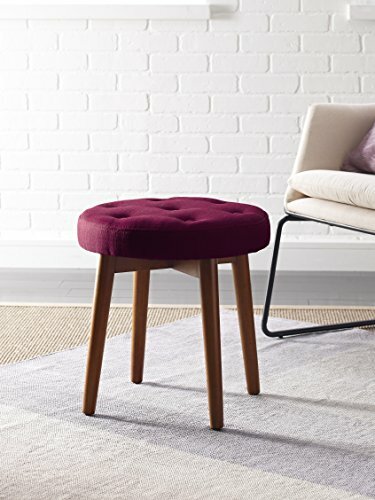 Add an Element of fun to any room with the Elle Decor Penelope round tufted stool in fashion-forward colors to match any decorating scheme. Choose from classic colors like cream, Taupe, light gray or dark gray. Or go with colors with more 'pop' like eggplant, red, lime, or cobalt. The warm natural tones of the legs complement the tufting on the top of this charming accent piece. Great for extra seating during a Friday night nacho party, or for just brightening up the room with a splash of color. Comes fully assembled so you can enjoy it right out of the box.